Last month, a Beijing woman surnamed Liu was promised 10 million yuan ($1.5 million) within three years if she joined a scheme that involved enrolling her friends and family. She thought it was a joke, but after traveling to Nanning, capital of the Guangxi Zhuang autonomous region, and listening to the organizer for four days, she was convinced and handed over 69,800 yuan. Earlier this month, she turned to her daughter and son-in-law for more cash to invest. "It was really strange because the amount of profit promised was so high," Liu's daughter said. "So I checked on the Internet and discovered it was a pyramid scheme." She searched online, found the China Anti-pyramid Selling Association website and contacted its president, Li Xu. He agreed to pretend to be a professor of economics and over a long dinner tried to convince Liu that she had been duped. When she eventually realized that she was the victim of a pyramid scheme, Liu broke down in tears. Later, together with Li she tried to recover a total of 139,600 yuan that she had paid into the scheme and to date has recovered just 19,000 yuan. Her case is one of the approximately 6,000 complaints that Li and his team in the China Anti-pyramid Selling Association have dealt with since it was established in 2006. Li estimates that currently there are approximately 10 million people involved in pyramid schemes, in 248 cities and 29 provinces, municipalities or autonomous regions. The association's office is a nondescript 60 square meter apartment in Songjiazhuang, Fengtai district, Beijing. It has two bedrooms, a sitting room and a small kitchen, three desktop computers and one laptop. In the sitting room, three people are answering calls while one staff member snatches some sleep on a bunk bed in one of the bedrooms. Another man eats instant noodles. On the wall is a red banner that reads: "Bringing better vision for trapped people." It was made by a woman surnamed Shen (who, like others in this report, did not want to give her full name for fear of retaliation), who presented it to the association after her mother was trapped in a pyramid scheme last year. None of Li's office neighbors know what is going on in the apartment and those who work in the office never divulge details of their families or friends because there is always the possibility that the ringleaders of pyramid schemes will attack them or their loved ones. "Scammers hate us and will retaliate if they know where we live," Li said. A pyramid scheme usually involves selling a fraudulent or substandard product or service, while in some cases the operators simply levy membership fees from recruits in order to capitalize the operation, without delivering any kind of product. 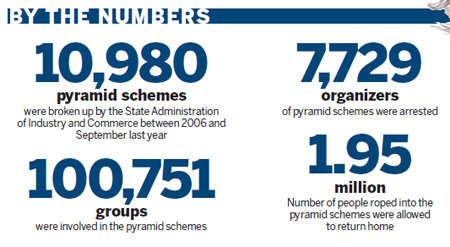 According to the State Administration of Industry and Commerce (SAIC), between 2006 and September last year, it was responsible for identifying and breaking up 10,980 pyramid schemes. They involved 100,751 groups and resulted in 7,729 organizers being arrested. About 1.95 million people roped into the schemes were allowed to return home. At the beginning of this month, in Nanning, the capital of Guangxi Zhuang autonomous region, 29 pyramid schemes were busted and 130 organizers were arrested, while the 1,306 participants found in the organizers' apartments were sent back to their homes. The country has just two private organizations that have been set up to battle these kinds of scams. In addition to the China Anti-pyramid Selling Association, the China Anti-pyramid Schemes Website operates from Wuhan, capital of Hubei province. It has 13 staff members and has helped out more than 3,000 pyramid scheme victims since June 2007. Both organizations rely on donations and have running costs of about 120,000 yuan ($17,700) a year. 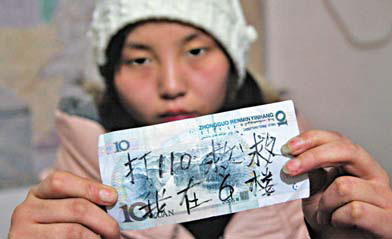 More than 5,000 families of former victims have provided donations ranging from 200 yuan ($30) to 20,000 yuan. Chen Hongsheng, president of Jet-Tern Co Ltd from Taiwan, made the most generous donation of more than 20,000 yuan to the association, after it saved one of his employees. Another anonymous victim who donated 500 yuan said, "They deserve more." "The biggest problem is that we don't have the right to raise funds," Li said, adding his organization was only permitted to receive unsolicited donations. For an organization to be legal and have the right to raise funds it must register with the Ministry of Civil Affairs and have an official supervisor. In 2001, the State Administration of Industry and Commerce (SAIC) set up the Office Against Pyramid Schemes and four years later the State Council promulgated the "Regulation on Prohibiting Pyramid Schemes". In 2008, SAIC expanded the department and increased its powers to crack down on pyramid schemes. Li said he contacted the Office Against Pyramid Schemes several times this year, but the office would not agree to be his supervising department. The Office Against Pyramid Schemes was contacted last week to confirm this but did not reply. It was only in February last year that "organizing pyramid schemes" became a criminal act and last week was the first time that a pyramid scheme organizer was imprisoned, in Beijing, when Tan Xuelin was sentenced to one-and-a-half years in detention for conning more than 90 people in a pyramid scheme that involved more than 300,000 yuan. "In reality, victims will not recover their money," said Gao Feng, deputy director of the economic crimes investigation bureau of the Ministry of Public Security, adding people are often too eager to make money and are thereby easily taken in by confidence tricksters. "The first line of defense against such schemes is to avoid speculating in them. The public has to be alert when making investment decisions, especially for unusually high profits." Zhang Hui, director of SAIC's direct sales regulation bureau, said anyone involved in the lowest level of a pyramid scheme can be fined up to 2,000 yuan ($295). 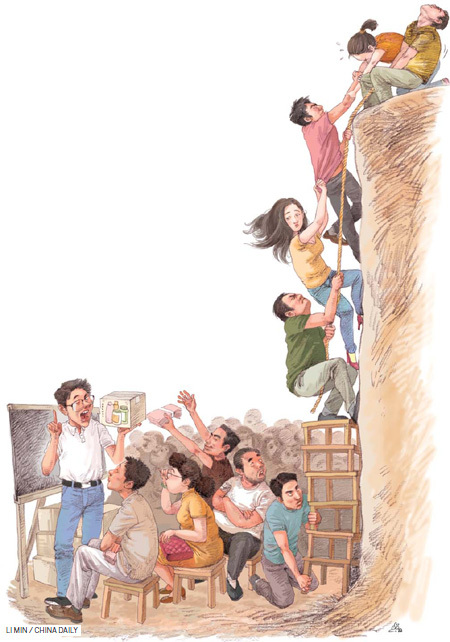 There are five levels of involvement in pyramid schemes and top-level organizers can have their property confiscated, be fined from 500,000 ($73,750) to 2 million yuan, and face jail terms, Zhang added. Typically, Li said, those operating pyramid schemes will target their friends or relatives because they are more likely to be trusting. After the organizers gain trust they then claim "the country supports their business" and promise a huge profit. After one week of "training" victims will generally pay money and start trying to recruit new members. Once someone is involved in a pyramid scheme it's really difficult to get out of it, Ye said, partly because they are financially involved and partly because they have been "brainwashed". "Organizers will threaten or beat us if they know we are trying to help victims," Ye said. For instance, one of Li's assistants, nicknamed Tian Xing, was stabbed by both the scammer and the female victim when he was trying to help her. 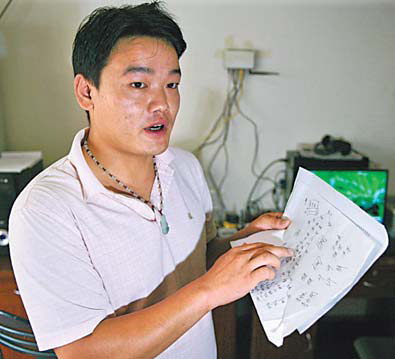 Li has several scars on his left arm, all bites from victims of pyramid schemes who he was trying to help. Both anti-pyramid selling scheme organizations have a high turnover of staff because of threats and shortage of funds. The Beijing association does not even have money to buy a new website server after scammers damaged the old one. Currently, the website is only online intermittently. Association staff members do cooperate with the police and SAIC to prosecute scammers but there is no official channel for complaints, both Ye and Li said. They have previously reported schemes involving sums of between 400 ($59 million) to 500 million yuan to the Economic Crimes Investigation Bureau, under the Ministry of Public Security, but Li said no action was taken. An official letter from China Daily to the Ministry of Public Security regarding the matter has not been replied to as of press time.